Don't be alarmed, Birthday Bear is not sick or hurt, he is volunteering at Greenslopes Private Hospital. It was our turn to dress Birthday Bear for George's Birthday. (New Readers can find out about our tradition here). Our friend George volunteers at the hospital 2 or 3 days a week. He does a variety of jobs there. One of them is taking a trolley of newspapers and books around for the patients. 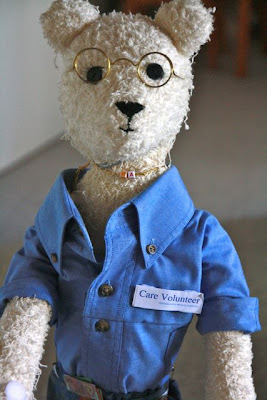 He wears a blue shirt uniform with Care Volunteer, Greenslopes Private Hospital embroidered on it. 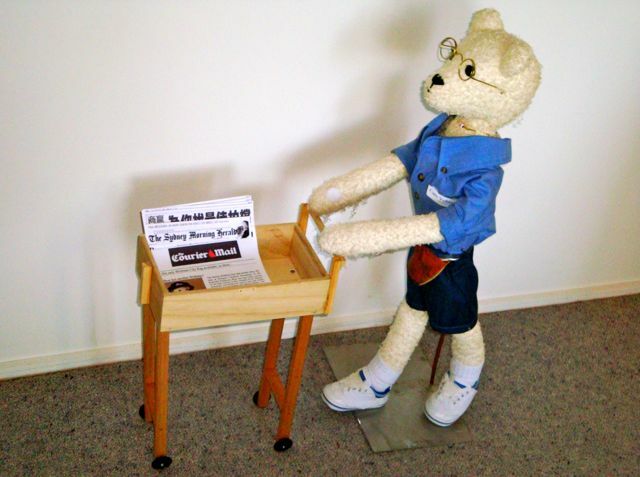 Bill made a trolley and some small sized newspapers for Bear to sell. He even wrote some relevant news articles. Unfortunately it has been raining on and off all week so the venue on top of Mt Coot-tha was abandoned and we went to a Sunnybank Hotel, where they are used to our silly antics with Birthday Bear. It is difficult to photograph in the dark dining room and George and his Bear were very patient waiting for me to try and get the light right. Eventually I had to use the flash. George was happy with his helper. We all had nice meals and a long chit chat mainly about the news, memories and upcoming holidays. It was a great outing, thanks all. Bear looks brilliant! My favourite I think. Lovely everytime I see that bear he makes me smile. i think this might be my most favorite of the BD bear. i love that mini newspaper.. great job. I love BD bear's uniform and paper trolley. Well done. It must bring a smile to everyone's face when they see him. Sorry the hike had to be cancelled. But sounds like you all made the best of it. Your group of friends seems to have fun no matter where you are or what you do. Birthday Bear obviously had another wonderful celebration. Bill did a great job with the trolly and newspapers. You have a wonderful birthday group. If ever I have to be hospitalized, I want Birthday Bear to give me books ! How cute and original ! I just love birthday bear. So cute. I am going to break down and purchase one of the macro lenses for my Canon. Your pictures have convinced me I really want one. You are all so creative! Each birthday you have a complete different bear. So funny and the newspaper is so amazing! I LOVE this bear, the newspaper and all. Fantastic idea Dianne! Have a great weekend. Happy birthday George! Birthday bear really made a wonderful representation of him. I love the gazette he is delivering. As Andrew says: Very cute. 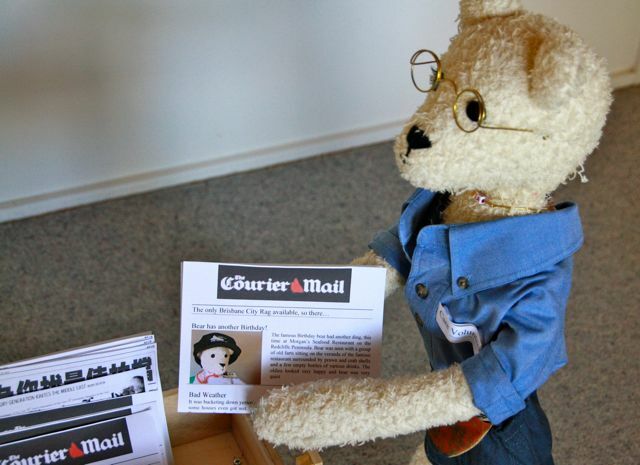 I think you would be a far better Editor in Chief of the Brisbane Courier Mail ( oops - the Brisbane "Rag") than the present one. Apply for the position immediately. 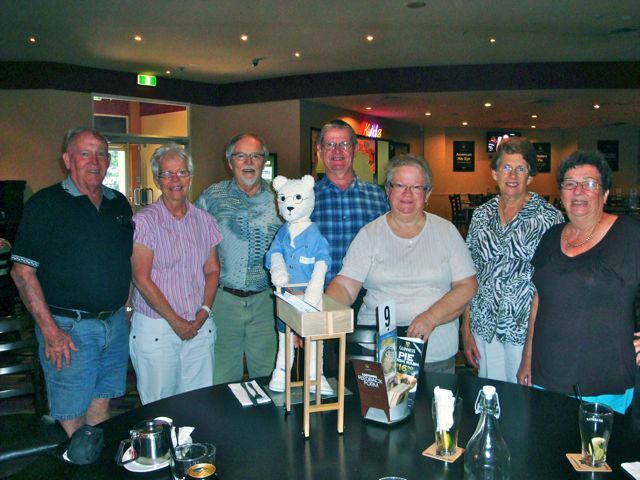 Funny post, Diane, as always with your birthday bear activities! OK - Bill - just hop to your CV creditials and post or hand deliver poste haste. I might then start buying the bloody "rag" again! Your Birthday Bear posts always make me smile. Bill did a get job on the trolley right down to those little wheels. I loved the newspaper! I am continually blown away by the amount of work your group puts into dressing 'BB' for the occasion. 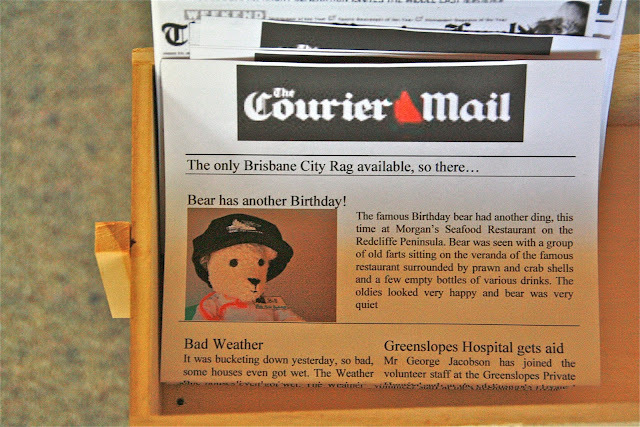 I love to hear what Birthday Bear is up to. It sounds like George's birthday celebration was a roaring success. 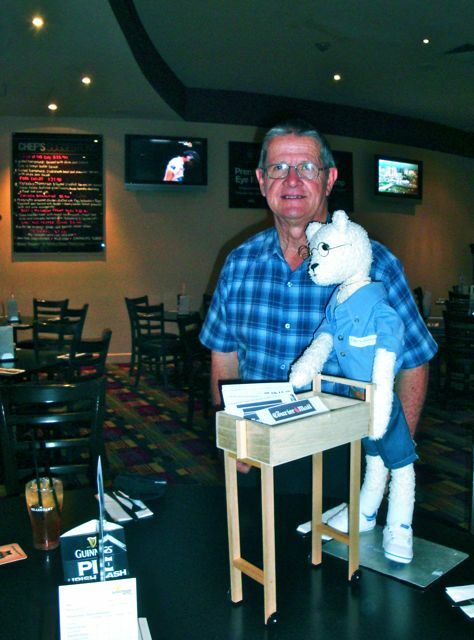 How nice of Birthday bear to volunteer. I'm sure it was a great day at the hospital. Great post, Diane!